Earth my body, Water my blood, Air my breath and Fire my spirit! I have returned to living on Hawai'i Island since the Spring of 2004, where I continue with practicing various aspects of ecological design on an acre of property in lower Puna district in East Hawai'i (about fifteen miles from Hilo). In December 1999 I completed my Master's degree in Whole Systems Design at Antioch University in Seattle. My degree and graduate project focus was what I call "cultural and ecological designing." From this and other experiences in my life has grown my Eco-Living practice. I'm originally from the San Francisco Bay area - I was born in Berkeley, and grew up in Albany, a 'small town' next door to Berkeley. I moved to Seattle, Washington from Hilo, Hawai'i where I had previously lived for about four years. In Hilo I worked at Hawai'i Community College as their Academic Computing Specialist. One of the things I did there was develop their original web site pages, way back when the web was brand new in the world. I also had fun working with the faculty and staff, supporting them in their computing endeavors; networking the college; and working with digital video production systems to produce some short video projects for the school. I have an acre of land in Puna district on Hawai'i Island. My various Eco-Living design work with that land is documented in the Projects section of this site, which is not presently up to date, so check back occasionally for new reports on previous and ongoing projects. If your day is gloomy, check the weather and surf report for Hawai'i and brighten it up! 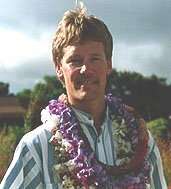 Before Hawai'i, I spent five years as a "migrant worker," teaching skiing and snowboarding in the winters and working as a computer contractor in Silicon Valley during parts of the off-season. I also worked and taught - and still do - in other areas of outdoor recreation - kayaking (ocean and river), mountaineering, climbing and backpacking, among others.